For more information on the following workshops, please contact the person listed for the training course. Click on course name to download/view training class details. If you have an idea for a training course or would like to host a course, please contact Stephanie Lewis. 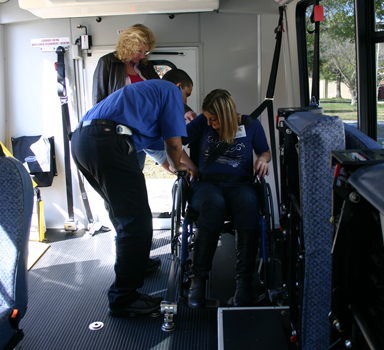 There are no fees to attend these courses for current employees of a Florida public transit agency who meet the criteria identified in the Transit Training Policies & Procedures. Unsure if you have an account for your course registration? Use the “Forgot Password” link to look up your account information using either your work/personal email address or username. If you cannot locate your account information please contact Stephanie Lewis, (813) 974-1123 before setting up a new account. NOTE: This course is a requirement to graduate from the Florida Transit Operator Trainer Training Certificate Program. Save the date for the following trainings. Subscribe to our listserv to receive notifications when classes are open for enrollment. Please contact Stephanie Lewis at (813) 974-1123 or zavacki@cutr.usf.edu if you have any questions or need to inquire about late registrations.